One of the unique things about being at The Ohio State University is that presidential candidates often visit campus. The student population is one of the largest in the country and being in a swing state makes the campus an attractive venue for candidates to share their message. Plus, Columbus has a fairly large media market, so candidates know that they will get coverage in central Ohio and throughout the state. As a graduate student in 2000, I was able to see Al Gore, John McCain, and Carrot Top (though I don't think the latter was running for president). With McCain passing away on Saturday, this post is obviously about him. I don't remember if McCain used the "Maverick" label at the time, and I honestly don't remember anything about the speech. It may have just been me learning more about McCain, especially his time as a POW, but I came away from his rally being impressed. He seemed more honest and genuine than many other politicians. McCain ended up losing the Republican primary to George W. Bush, and it's interesting (that's one word to use) to have seen what would have happened if McCain won the 2000 election. In my opinion, McCain realized that he had to go more to the right to get the Republican nomination. While I don't have a specific example of this off the top of my head, it seemed like he played more to the base between 2000 and when he ran again in 2008. This time, he successfully won the nomination, but lost the general election to Barack Obama. Over the past few years, McCain has been one of the few Republicans willing to speak out against Donald Trump, even though he ended up voting for many of his policies. I'm actually not sure if I admire McCain or not for not stooping to Trump's level after the ridiculous statement that “[McCain] was a war hero because he was captured. I like people who weren’t captured.” While I disagree with many of his politics, I admire McCain for his service and being one of the seemingly few politicians willing to work with Senators and members of Congress from the opposing party. McCain dedicated his life to the United States and deserves respect and appreciation for this. Proof that McCain spoke at Ohio State on February 26, 2000 courtesy of The Lantern. Update: Drew Magary of GQ has some thoughts on McCain that is worth checking out. Today's video is "No Tears Left to Cry" by Ariana Grande. I'm pretty sure that it's the three notes (da-da-da) that make this song for me. It's really simple, but it works. Now, don't get too dizzy watching this video. 2. When did face tattoos become such a big thing? When Mike Tyson got one years ago, it was major news. 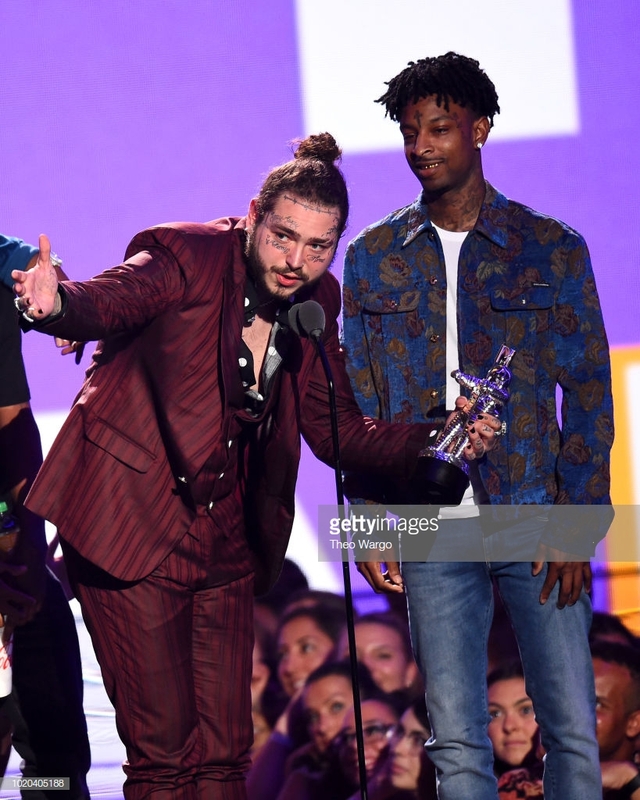 For example, pictured above is Post Malone, who I assume chose his stage name as a tribute to the former Utah Jazz power forward. Someone also really could have showed him how to move the microphone up. Besides the awards he won, it was also a big night for him as he got to perform with the guy from the Skittles commercial. Camila Cabello won a few VMAs including video of the year and artist of the year, so you would think that Tiffany Haddish would be able to pronounce her name correctly. If you don't show up to the awards show, you don't get an award. 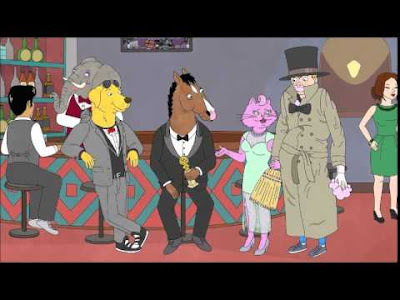 Beyoncé and Jay-Z, Bruno Mars, Ed Sheeran, Childish Gambino: No (major) awards for you! I'm pro-Ariana Grande. That is all. At the beginning of the show, Cardi B held one of those award statue moon-man things. Yet, when she won the award for best new artist, she remarked how heavy it was. Does that mean that she held a fake award at the beginning? Is there a conspiracy here? Finally, this was by far my favorite part of the night. That is Bebe Rexha dancing backstage. Meanwhile, the guy on the left just wanted to get by to do his job. I love the look on his face. We took a family trip back to the 'Burgh last weekend, so of course I have some notes (and pictures) from the trip. This never gets old. * I had never been on the USS Requin before. While I found it very cool, I would not recommend taking an 11-month old on it as you have to climb from compartment to compartment. Not very easy to carry a kid through this. Who knew that submarines weren't designed for infants? * Major props to Eat 'N Park in Homestead for having this sign in the bathroom. * I've gone to the Carnegie Museum of Natural History (the dinosaur museum) since I was a young child and I've always parked on the street. For this visit, I parked in the garage behind the museum. Has the garage always been there or is it brand new? * There was a guy wearing a Jurassic Park T-shirt at the Carnegie Museum. I thought about taking a picture, but that would have been rude (and I couldn't stealthily take one without getting his face and/or his kids in the picture). * A highlight for the kids was the blue slide at Frick Park. The blue slide isn't quite as blue as it used to be. By the way, very nice job by the people who use the playground. People left cardboard boxes there so that kids could use them to slide down. * Who would travel to Pittsburgh and wear Pittsburgh sports gear just walking around the city without going to a game? Makes no sense! * This is the third consecutive trip to Pittsburgh where I did not stop at The O. Stupid Pennsylvania Turnpike traffic (and very heavy rain) for ruining my lunch plans! * I drove by the house where I grew up which is currently for sale. My parents sold the house about 8 years ago. Anyway, it looked the same from the outside, but I'm not sure if the current owner moved out or is just lazy or unable to attend to the yard, and I couldn't get past how awful the yard looked. Grass was overgrown and you could barely see the concrete path in the front yard leading to the door. And now this song is in my head. * Oh, it was also odd seeing my elementary school not there anymore. It was an administrative office for many years, and apparently it was torn down a few years ago. Now it's just grass. * Naturally, I randomly ran into my brother's first grade teacher and her daughter who someone I knew from when I was in high school. Because Pittsburgh. Hopefully, I'll be back to the 'Burgh again soon. 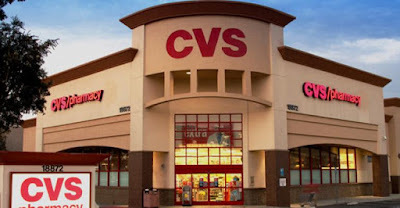 Last week, I went to CVS to try to find a plastic covering for a cell phone screen. They only had one type available, and while I didn't think it was what I needed, I made sure that I would be able to return it with the receipt and bought it for $15. I also had a CVS coupon good for 40% off one item, so I actually paid $9 plus tax. After confirming that the covering wasn't the right one, I returned it on Monday. The cashier put the $9+ back on my credit card, and then told me that they would give me $6.36 in store credit for the coupon. Although I asked her several times if she was sure since this didn't sound right, the cashier insisted that I was due the balance. Unfortunately, there was something wrong with the register, so she was unable to give me a store credit on the card. She called over a manager, and at this point, I was worried for her as I figured she would get in trouble for essentially giving me free money. The manager came over and also had difficulties with the register, so she handed me $6.36 in cash. Basically, CVS gave me $6.36 for using a 40% off coupon on a product that I returned. I don't get it! People regularly and justifiably criticize Metro, but I think they deserve credit for once. The Unite the Right rally (the same group who protested in Charlottesville last year) is scheduled for Sunday. Like other events in DC with people coming from out of town, most people will take Metro to get downtown. However, it just so happens that Metro begins a major construction project this weekend with two high-traffic stations (Farragut West and McPherson Square) closed on Saturday and Sunday. Another busy station (Metro Center) is only accessible via the Red Line. Service is going to be such a mess over the next two weeks, that Metro is telling people only to use them if you have no other options. While it's going to be a major inconvenience for people like me who rely on Metro to get to work, maybe Metro is actually helping by making it more difficult for the Unite the Right folks to get to the rally. What a brilliant plan! Of course, Metro also floated the idea of having white supremacist-only cars to help prevent potential fights, so maybe not. When the ball was hit, the score was tied at 1-1 in the 9th inning against a team the Nationals are chasing in the standings. This should have been a double with runners on 2nd and 3rd and the Braves taking a 2-1 lead. Instead, Harper seemed nonchalant as he threw the ball to home plate. I'm sure you're thinking, Harper didn't have a chance to get the out at home, so it doesn't really matter. Fine. What about WAR, or wins above replacement? Harper currently has a WAR of 0.9 which is good for tied for 95th...in the National League! Todd Frazier, Alen Hanson, Gorkys Hernandez, Hunter Renfroe, and Adam Frazier are all better than Harper in this category. And none of these players are going to earn $300 million! 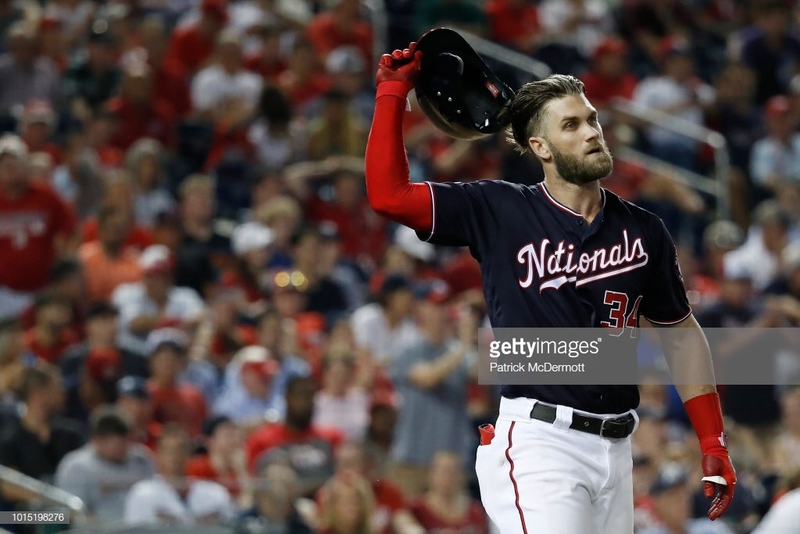 If you want a guy to hit home runs, Harper (tied for 3rd in the NL) is your guy. If you want a guy to get on base, Harper (12th in the NL), is solid. If you want a guy who strikes out a lot, Harper (4th in the NL) is also your guy. For $25 million or more a year, I'll pass.